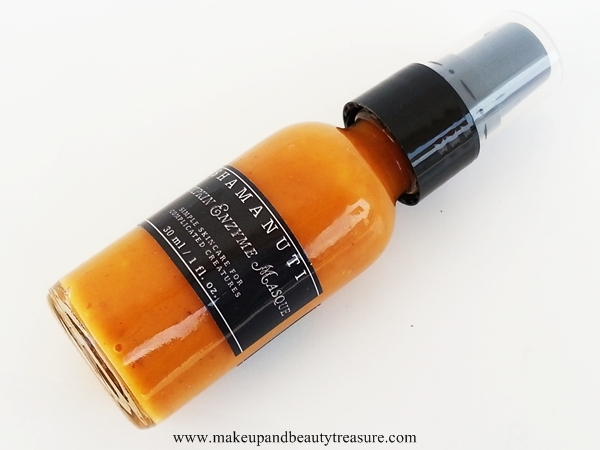 Shamanuti Pumpkin Enzyme Masque comes in a clear glass bottle with a black pump dispenser. There is a plastic lid that is fitted properly over the pump to avoid any leakage or drying of mask whilst traveling. The face mask is bright orange-ish yellow in color just like a pumpkin. 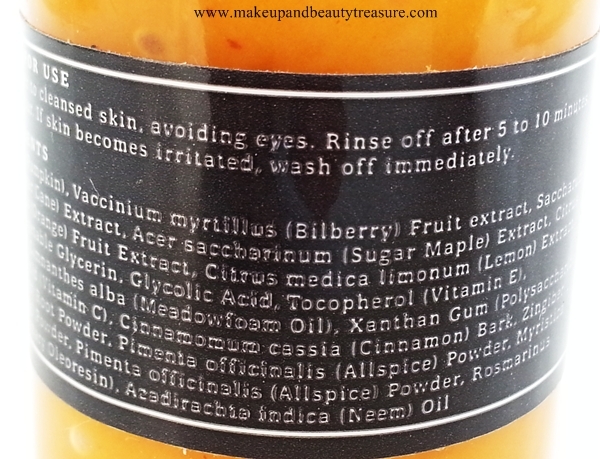 It smells of pumpkin which I really do not like but it is not strong and fades once it is applied onto the skin. The texture of the mask is soft and smooth with good consistency. 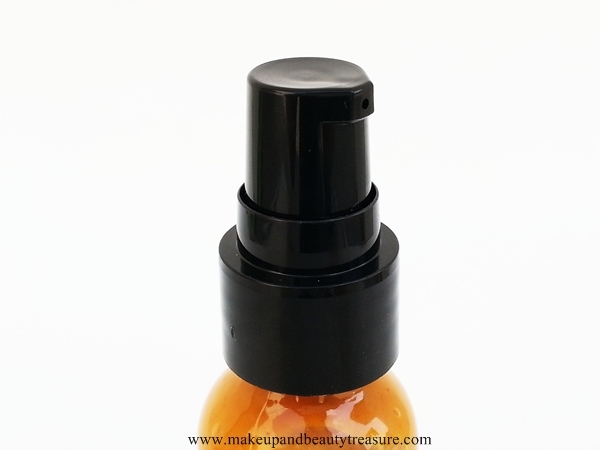 It is a ready to use mask and can be used directly from the bottle. It is easy to apply and totally mess free. It spreads easily across my skin without tugging. The consistency is really good and I do not need to keep my skin damp for easy application. I always make sure to wash my face with a face wash (currently I am using The Nature’s Co Peppermint Face Wash. It is perfect for oily skin in summer season and gives a cooling sensation to the skin.) to remove all dirt and grime off the face. I apply only a thin layer of face pack and it works pretty well on my oily, combination skin. The pack feels really nice on skin. I then let it sit on my skin for about 10-15 minutes. It does not give tingling sensation that I really like. It does not harden or tighten the skin. It is easy to remove and gets removed easily with a warm washcloth (I use Lightload Towels. Reviewed HERE) and does not leave any residue behind. My skin instantly feels soft, very smooth and super radiant instantly. It gives a nice healthy glow to my skin with regular usage. It does not dry out my skin and makes it feel super smooth. I do not feel the immediate urge to moisturize the skin. It is very moisturizing so I make sure to use it twice a week to give a nice boost of radiance to my skin. It does make my skin slightly oily after few hours (humid weather might also be responsible) but did not break out my skin. I totally love the brightness it gives to my skin and I am definitely saving it for my roka ceremony and wedding to get glowy skin instantly. 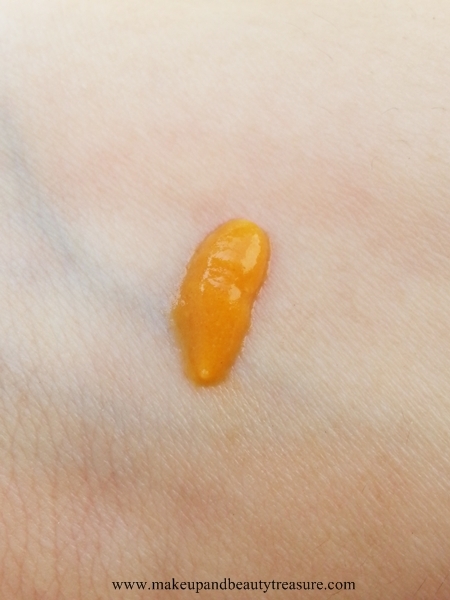 If you are not aware, pumpkin is full of vitamins and enzymes that brightens and nourishes your skin. It also contains nutmeg powder, ginger root powder, vitamin E, lemon, neem oil, glycerin etc. • Does not tingle on the skin. • Gives a lovely glow to the skin instantly. • Makes skin soft, smooth and hydrated. • Contains all good and natural ingredients. • Does not break out my oily, combination skin. • Shamanuti provides International shipping. • Pricey but if the product works for you then it’s worth it. 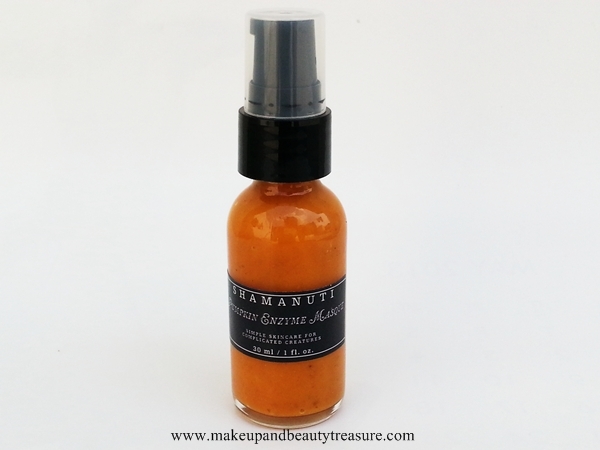 Shamanuti Pumpkin Enzyme Mask is the best face mask for dull, dry and lifeless skin. It is anti-oxidant rich face mask that makes skin soft, smooth and radiant. It is natural and safe for all skin types including sensitive skin. Though it pricey, I love the results it delivers. I would HIGHLY RECOMMEND it everyone. • Apply the face mask for 15-20 minutes only. • As it is slightly oil based, make sure you remove it with a warm washcloth to get clean and radiant skin. • Don’t forget to follow this step by splashing cold water on your face to close pores. • Use it at least twice a week or when your skin feels dull and lifeless. • It might cause tingling sensation to sensitive skin but don’t worry it gives you a signal that it is working on your skin. • Always try a small size to know if it works on your skin especially if you have extremely sensitive skin. Have you tried any face mask that brightens up your skin?